Wing span: 1 5/16 - 1 3/4 inches (3.4 - 4.5 cm). Identification: Upperside is bright orange with wide dark borders; male forewing has a distinct linear stigma. 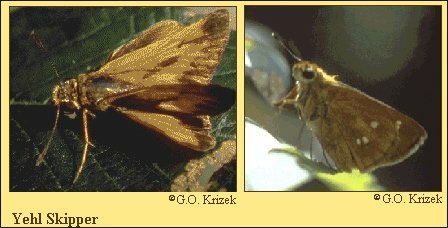 Underside of hindwing is dark brown (female) or orange (males); both with 3-5 pale median spots. Life history: To await females, males perch about 3 feet above the ground on sunlit vegetation. Flight: Two broods from late May to mid-June and from mid-August to mid-November. Caterpillar hosts: Probably cane (Arundinaria species). Adult food: Nectar from flowers including sweet pepperbush, chinquapin, pickerelweed, and swamp milkweed. Habitat: Clearings in wet or swampy woodlands. Range: Southeast Virginia west to southwest Missouri; south to east Texas, the Gulf Coast, and northern Florida. Conservation: Populations should be monitored because of gradual draining and conversion of habitats. The Nature Conservancy Global Rank: G4 - Apparently secure globally, though it might be quite rare in parts of its range, especially at the periphery. Hopkins University Press, Baltimore. 294 pages, 54 color plates. field guide #4. Houghton-Mifflin Co., Boston. 396 pages, 48 color plates. Stanford, Calif. 583 pages, 64 color plates. adjacent parts of Canada and Mexico. Denver and Fort Collins, CO.
Canada. University of Toronto Press, Toronto, ON. 280 pp. Opler, P.A. 1998. A field guide to eastern butterflies, revised format.